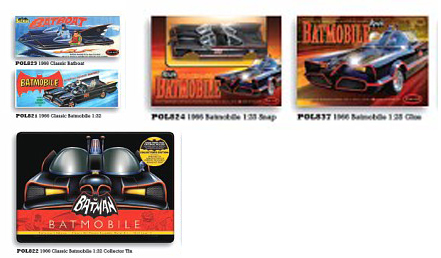 The online hobby world was abuzz this week with sightings of new Polar Lights Batmobile product images showing up at hobby shows and online blogs. We got tips and photos from Tim and Alex so thanks guys! 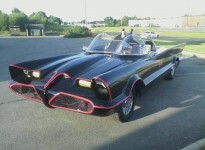 Here are a couple teaser shots. 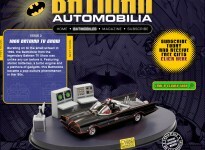 Aside from the reissue of the 1:32 scale Aurora Batmobile it looks like we may also be getting a 1:25 prepainted body snap kit and a 1:25 full glue assembly version. More as we know it. Time to reissue our 1:25 figures, hmmmm? Working on a proto lighting kit now,it should fit this as well….. I KNEW this was going to come from Polar Lights sooner or later ! I remember having the original Aurora kit way back as a kid. Can’t wait to build it again !